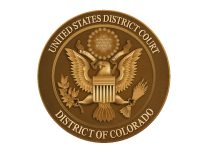 Please take notice that motions to seal, pursuant to D.C.COLO.LCivR 7.2 or D.C.COLO.LCrR 47.1, have been filed in the cases listed below. Any person or entity may file objections to a motion on or before the date specified below. Recently Filed Motions to Restrict are available for downloading and/or printing through PACER for a nominal fee or by coming to the Clerk's Office for free viewing.